750 ml oops...or was it? Quick story: Back in 2016, I made a mistake converting quarts to milliliters for a cocktail recipe (see below) and ended up buying a ginormous bottle of Christian Brothers VS Brandy, which sat forlorn and forgotten on our home bar for over a year. A couple of months ago, I saw it lurking in the back row of our collection of bottles and decided that it was time to either drink it or toss it (I go through spurts of cleaning and organizing when the weather changes), so I poured myself a small glass to discover whether it was drinkable on its own. The brandy was much sweeter than I usually prefer, but much to my delight, the glass went down easy and I experienced perhaps the most blissful buzz that I've ever felt from any other type of alcohol. It was drinkable...and I poured myself a second (and third?) glass. Since that evening, me and brandy have been like peas and carrots, and it has become my sipping drink of choice this winter. So what is brandy? In short, it's distilled wine (wine boiled down to become a stronger spirit). The name comes from the Dutch who called it brandewign or "burnt wine," which was eventually shortened to "brandy." In the 16th century, European traders would set up stills in ports to boil down mediocre wine which they could then sell for a higher price or preserve and transport for a lower price than the original wine. The distilled spirit could be mixed with water as a substitute for wine at the end of its journey, but brandies eventually became quite tasty in their own right with (purposeful or accidental) barrel aging and multiple rounds of distillation. Because brandy has somewhere between 35-60% ABV, buying a bottle at the liquor store is much more akin (with respect to cost) to buying a bottle of liquor than wine. It is produced all over the winemaking world, so "getting into it" is a serious pastime. For those of us that neither have the time nor money for a deep exploration, discovering the basics and most popular varietals is a good enough educational start. 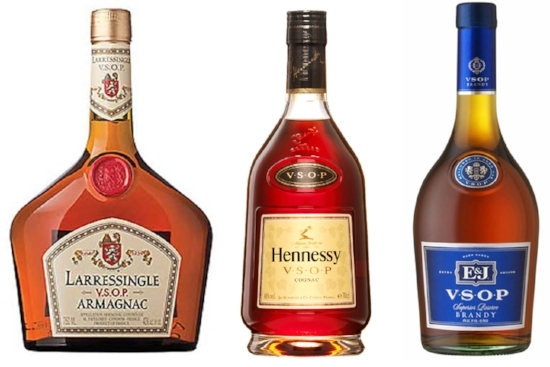 The two most well known French brandies are Armagnac and Cognac which are made from specific varieties of grapes in, you guessed it, the Armagnac and Cognac regions of France. Cognac is made in batches in a pot still, whereas Armagnac is made continuously in a column-shaped still called an alembic. Both are aged in oak barrels once distilled. California brandies are made with American grapes and tend to be less expensive and less complex than their French cousins. Because brandy is an aged spirit, it's important to understand the age-grading metric that's often found in the name of the product so you know the richness and complexity to expect from the bottle. "V.S." - very special - is aged for at least 2 years. "V.S.O.P" - very superior old pale - and "Reserve" are aged for at least 4 years. "X.O." - extra old - and "Napolean" are aged for at least 6 years. "Hors d'age" - beyond age - is a designation for Armagnac that has aged for at least 10 years. Now that we have covered some brandy basics, you're probably wondering how one is supposed to drink the stuff. Good aged brandy is typically served neat in a snifter or balloon shaped bowl so that the aroma of the spirit concentrates at the top of the glass as it warms in your hand. Younger and less expensive brandy can be consumed in this fashion too, but it's better mixed into cocktails which are incidentally more fun to drink in warmer weather. Brandy serves as a lovely foundation for a variety of punches, daisies, juleps, and sours. Some classic brandy cocktails include the Sidecar - a tart blend of cognac, Cointreau and lemon juice - the Metropolitan - a mellow concoction of brandy, sweet vermouth and Angostura bitters - and the Brandy Alexander - a sweet sipper of cognac, crème de cacao, and cream. The cocktail that started this whole brandy adventure was a batch of Charleston Light Dragoon Punch, that we made as the signature drink for our Carolina Cooking Supper Club event. Chef Sean Brock serves up cups of this historic sweet tea-based punch at his restaurant, Husk, in Charleston to the delight of many a guest. We make our version with 1/2 c less sugar than Sean's recipe since the sweetness of the brandy, rum, and peach brandy do a great job standing up to the bitterness of freshly brewed black iced tea and fresh lemon juice. In typical punch fashion, Sean's recipe is made to serve 20, so invite your friends and family over to try this foray into the world of brandy at home!